Yoga Teacher, Writer, and Studio Owner of Yoga Kitchen. Raised in the long grass and the green fields of Kildare she uses the practice of Yoga to nourish the roots that connect us all. Trained in Hatha, Vinyasa Flow, Womb Yoga and Yin, she teaches a dynamic and holistic practice that connects you to your breath, body and heart. Yoga, Pilates and Post-Natal Pilates Teacher. Raised in Cork and teaching in Dublin since 2007. Aideen loves the precision of pilates and the expansiveness of yoga. Trained in Pilates Mat levels I, II, III and Pilates Small Equipment, Hatha Yoga, Yin Yoga, Swedish Massage and Reflexology. She teaches with a down to earth approach, building strength and balance through pilates, while diving deeper with yoga, connecting the body and mind to the breath. Each practice enriching the other. Kate teaches a variety of Yoga and Pilates classes across the city and leads regular Yoga Surf Trips to Donegal. Kate is passionate about moving well and the connection between movement, the mind and the body. Kate tries to lead all classes from the heart, connecting with the natural wisdom that lives in our bodies. We will move, wiggle, strengthen & stretch - allow our minds to get our of the way & connect with our intuition, inner knowing & strength. Yoga teacher and outdoors enthusiast. Lauren practices yoga to cultivate self awareness and compassion toward others. Originally from Brazil and living in Ireland since 2011, Jackie was first introduced to yoga on this beautiful green island! Influenced by strong Vinyasa flow and Ashtanga, she aims to build an awareness of body and mind in her students through physically challenging classes, and help them safely perform poses to the best of their ability with the correct alignment. Jackie completed her 250-hour Classical Yoga Teacher Training at Samadhi under the guidance of experienced teachers and has also completed training in Yin Yoga. Daithí is an RYT 200 Hrs. registered teacher and is currently undertaking a 300 Hrs. Anusara yoga advanced teacher training program. He is currently researching a framework which marries Yoga Nidra and Art Therapy for his Art Therapy Masters dissertation. Daithí loves facilitating workshops on social dreaming, deep listening and therapeutic artwork. Daithí is a keen freediver (4* AIDA) and loves any combination of breathwork and movement. David Curtis (500 E-RYT, SYT) has been leading Vinyasa Yoga Teacher Training Courses since 2006 throughout Ireland and brings a wealth of many years personal training, practice and teaching experience to his trainings. His courses are well structured and professionally run and have earned him a reputation of excellence in Yoga Teacher Training in Ireland. His style of teaching is influenced by many styles and methods of Hatha Yoga yet is rooted in activities that free the energetic body from its obstructions and harness the potential of the lifeforce safely and effectively. Rohan Hennessy was introduced to Yoga at the tender age of fourteen. Lilah has been exploring yoga since 1997. She studied Raja Yoga for 9 years, Ashtanga Yoga Vinyasa for 7 years, as well as various other spiritual traditions including Ayurveda, and The Wolf Clan native Indian philosophy. She has been a yoga teacher since 2002 and has taught in different countries. She has led workshops combining Asana and Philosophy, Yoga and Ayurveda, and Mula Dance Spirit. She shares her teaching with simplicity, clarity, and the joy of practice. Yoga teacher, nature lover and a backpacker Gabriella is originally from Bella Italia but has been living in Ireland for 6 years and consider it her new home. Trained in classical Hatha yoga, she loves to practice Iyengar, Vinyasa, Ashtanga and Restorative and considers her style of teaching a mix of all those practices with a predominance of Vinyasa. Gaby has a holistic approach, focusing on both the spiritual and physical aspect of Yoga during the whole lenght of the class. She likes to emphasize that Yoga is not about being able to reach our toes, it’s about the action and the feeling that each pose gives us. She also loves to set an intention for each class, which relates to both body and soul and she builds her classes around that intention. Máire teaches Qi Gong and Taoist internal energy practices - the cultivation of life-force. She is a certified Universal Healing Tao Instructor and organises Grandmaster Mantak Chia’s visits to Ireland. After exploring many spiritual traditions, Máire finally found truth in the Tao. She loves sharing this ancient knowledge with others so that they may feel the amazing benefits. Máire believes that health and happiness is our natural state, and can be easily accessed through the simple practices of the Tao. Educator, yoga teacher and mover. From the Dublin mountains Eimear draws on the practice of yoga to cultivate balance in every facet of life, yin and yang. Trained in vinyasa, hatha and yin she teaches a flowing and expansive vinyasa practice grounded in organic movement. Her yin style is one of self-inquiry, fostering ease in body and mind. 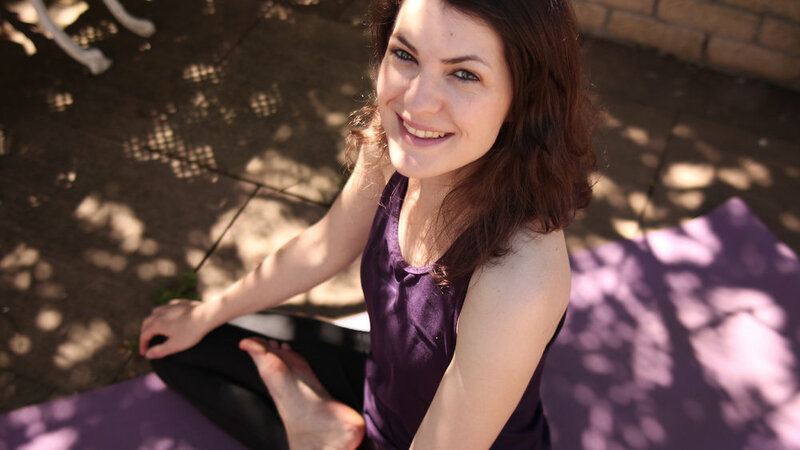 Yoga teacher and passionate adventurer, Aimee has a Classical Hatha Yoga training. Influenced by her Vinyasa and Ashtanga practice, her classes use slow flowing sequences, allowing you to get to a feel for each posture and finding the balance between strength and softness. She believes that by working on the connection between body and breath we can explore the exciting and endless capabilities we hold within ourselves and find the freedom and space we need for our minds and body. Sarah completed her Vinyasa Yoga Teacher Training right here in Dublin and continues to study, train and learn from her incredible teachers (and students!) every day. With a deep love of dance, Sarah is drawn to a creative, flowing yoga practice with plenty of space for intuitive movement and finding what feels good in your own body. You can expect a sweet, slow and soulful flow that will leave you with a smile on your face, a connection to your heart, and a lil more love and appreciation for your beautiful body.